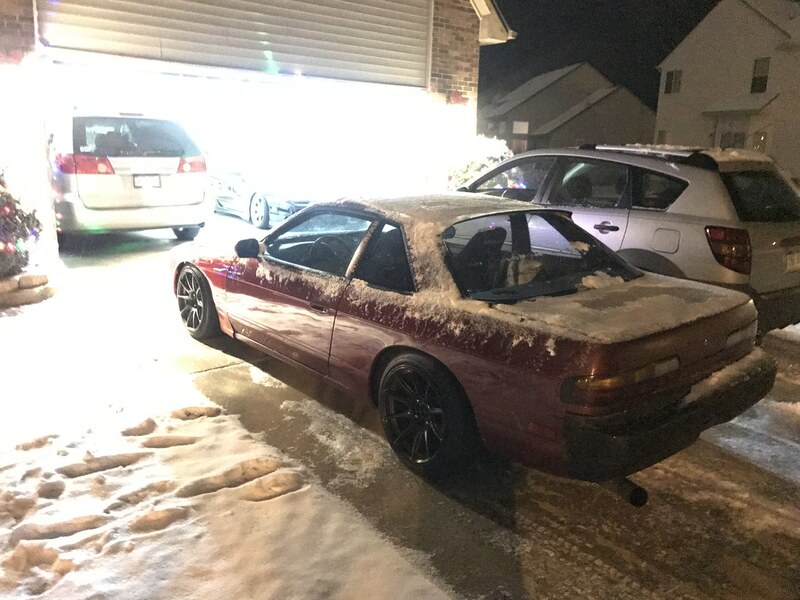 The most recent 240SX to join my stable (albeit on a temporary basis) came to me through the local Facebook Marketplace S13 group. The car had been listed at $5k for quite a while which was a a fair amount more than it was worth. 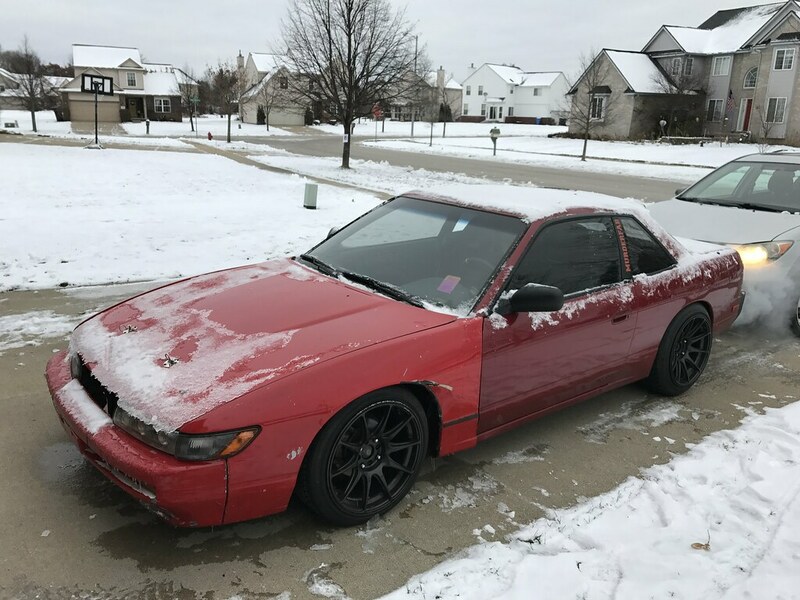 The owner lowered the price and still was not having much luck with moving it, so I reached out to him during the Thanksgiving holiday to see if it was still available. After creating a quick spreadsheet to determine the value of all of the items on the car, I decided that it would be worth trying to buy the car and part it out for a fairly quick profit. After some negotiation, I sent a deposit and we set this past Tuesday as the day I would come and pick the car up. My good friend Tim that I often mention here on the site was kind enough to drive me out to the car since it was located near his home- a little over 100 miles from me. When we arrived it was dark outside, snowing, and about 20º outside. The battery was of course dead so we needed to jump start it, but the SR20DET seemed to idle nicely once the car warmed up. 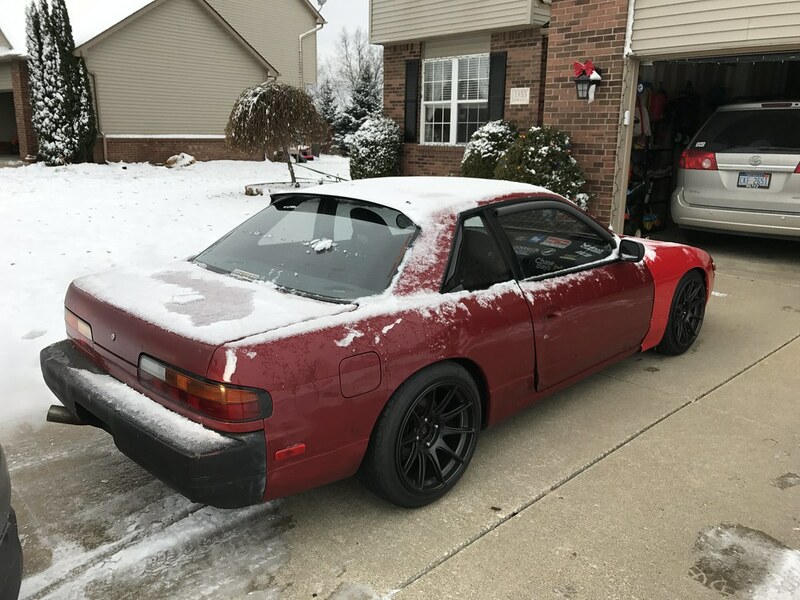 It was covered in snow from the winter storm that had moved through a couple days earlier and equipped with summer tires and a welded differential so I knew I was in for a treat with attempting to make the hour and forty five minute long trip to my house. After limping the car down the street to the gas station, I discovered that it must have been running on fumes. I have never put more than 12.5 gallons or so into my S13, but this one took just over 14. I of course left the car running while gassing it up so that I wouldn’t have to worry about getting it to start again. After saying goodbye to Tim I hopped on the freeway and started what felt like the longest drive of my life. There were many issues with this car that made it a handful to drive. There are no heater controls meaning that I was freezing the entire trip home. The windshield was fogging up but due to the lack of heat there was no defrost. 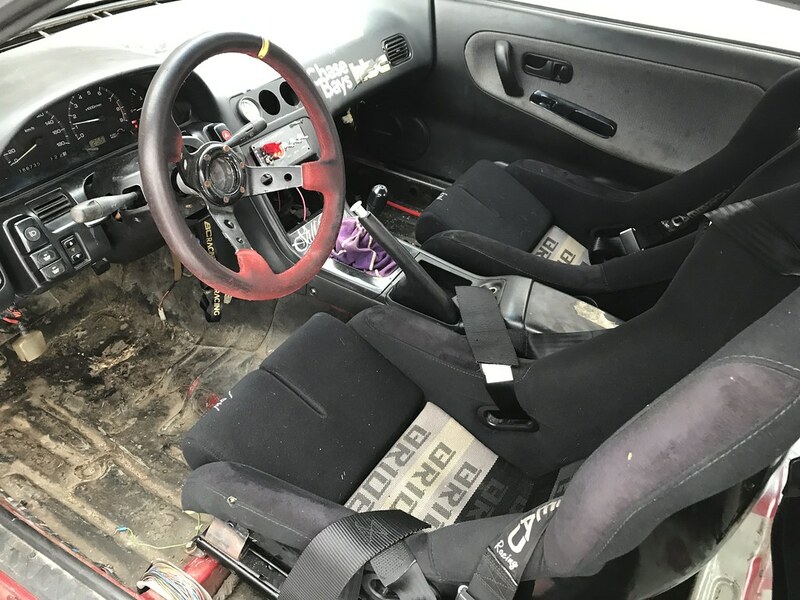 No rear view mirror, no wiper motor, no interior of any kind to speak of aside from the replica Bride seats and poorly mounted racing harnesses. The straight pipe exhaust was crazy loud and the fuel tank access cover was not bolted down making for some beautiful sounds and smells the entire drive home. The car was also stumbling and misfiring at certain RPMs so I needed to keep it at a fairly low speed for it to cruise consistently. I am sure this is likely a simple issue with the engine that I can fix when refreshing it. I thought I was going to be pulled over for sure for not having a license plate on the car, but thankfully I made it without a hitch. I’ve never been so happy to pull into my driveway. I checked out the car a bit more the next morning and moved it into my garage. 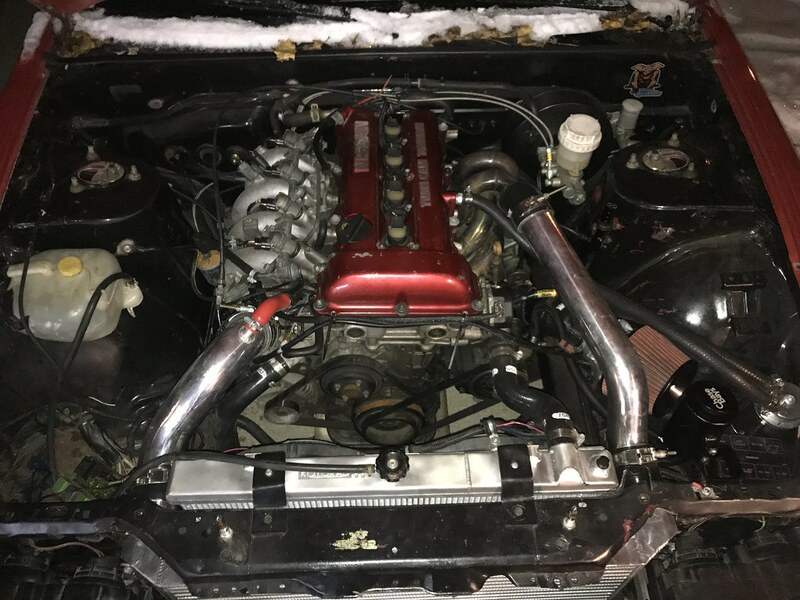 The plan is to strip it down and sell a majority of the parts on it with the hope that I can keep the SR20DET swap for my new coupe project. I will also be holding onto the Silvia hood for my build as well. Just about everything else is going to be sold off to recoup some funds and hopefully end up with a free drivetrain… for the chassis that I also somehow wound up getting a hold of for free. This car isn’t in terrible condition, but one quarter panel is fairly banged up. It also appears to have had some rust repair done in the past and the chassis harness was messed with to install the switch panel. I am much better off building my other coupe chassis that hasn’t been messed with nearly as much and is virtually rust free. So yeah- pretty crazy stuff! I never dreamed of having an engine for my project any time soon, but I had to jump on this opportunity. 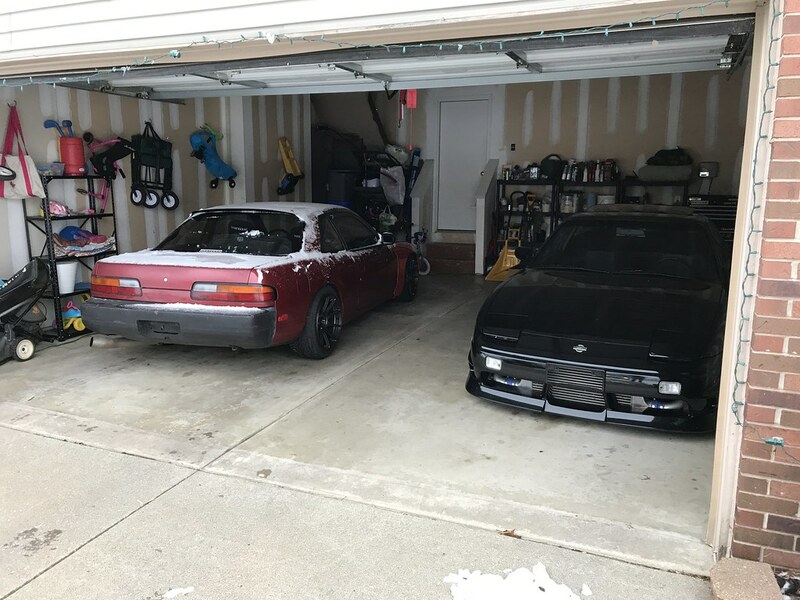 Hopefully things go smoothly in the coming weeks and I am able to part out and sell the car quickly so that I can get my wife’s car out of the snow and back into our garage. That’s all for this week! I’ll be sure to keep everyone updated on the project’s progress. Thanks as always for stopping by! PS- I still have just a small handful of my first run of stickers left if anyone is interested over at the store page. Thank you to everyone that has shown their support! You’re hustling on this one, it is nice to see.